This interesting surname has an unusual number of possible origins. Firstly, the surname may be from an early medieval nickname for someone thought to resemble the bird (the heron), perhaps a particularly tall thin man. The derivation for this source is from the Middle English "heiroun, heyron", heron, a development of the Old French "hairon". The creation of surnames from nicknames was a common practice in the Middle Ages, and any modern-day surnames derive from medieval nicknames referring to personal characteristics. Ralph Hairun is recorded in London in the 12th Century. The surname may also be of Anglo-Saxon origin, and a locational name from the place in North Yorkshire now called "Harome", which was recorded in the Domesday Book of 1086 as "Harun", and means "(place of) the stone", from a derivative of the Olde English pre 7th Century "haer", stone; the first recording (see below) is from this source. In some instances, Herron may also be an Anglicized form of any one of three Irish Gaelic names: "O'hEarain", descendant of the feared one; "O'Huidhrin", descendant of the swarthy one; or "Mac GiollaChiarain", son of the servant of St. Ciaran. 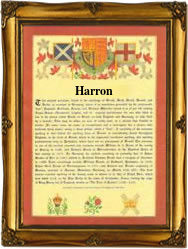 The surname may also be found as Heron, Herroun and Hairon. The marriage of Dorythie Herron and William Hartwell took place on November 6th 1547, at the Church of St. Benet Fink, London, and on August 20th 1709, Hugh, son of Andrew Herron, was christened at Carnmoney, County Antrim. The first recorded spelling of the family name is shown to be that of William de Herun, which was dated 1150, in the "Pipe Rolls of Yorkshire", during the reign of King Stephen, known as "Count of Blois", 1135 - 1154. Surnames became necessary when governments introduced personal taxation. In England this was known as Poll Tax. Throughout the centuries, surnames in every country have continued to "develop" often leading to astonishing variants of the original spelling.